The members of the Nassau Society of Natural Sciences and visitors can use the library of the department of Natural Sciences Collections (after reservation), which preserves true treasures of 300 years of scientific history. In order to buy new books and journals, the department disposes of 2000 EUR per year, which just covers the basic needs. So therefore we are grateful if you want to donate books, journals or money. The major part of the library (about 40,000 books and 20,000 reprints) is documented in the journal Jahrbücher des Nassauischen Vereins für Naturkunde. In 1935 a large part of the library was transfered to the Hessische Landesbibliothek in Wiesbaden. Nevertheless, today's stock is still considerable and, in the first place, supports the staff's work on the collections. 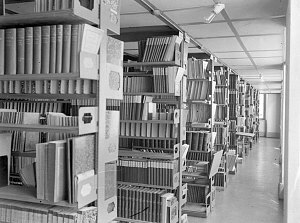 With the promotion of public funds, we hope to computerize a complete inventory of the books, journals and reprints in the next years. In addition Mrs. Helga Arens-Turri, Mrs. Ute Claussen, Mrs. Gesine Friedrich and Mrs. Cornelia Heckert are working in the library as volonteers. They have started with a computerized inventory in 2001. Still it would be helpful to get your support (see Collaboration). The departments library is a good place to loose track of time and to go exploring. 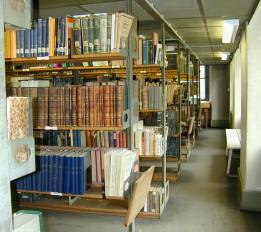 If you are interested in other libraries, visit the Wiesbaden Study group on Information e.V.. In addition Mrs Rita Schuck offers an access to the natural history library of the Museum Darmstadt.